By Chauncey DeVega15 million Americans were “food insecure” in the United States during 2012. The Great Recession has increased the number of Americans who do not have sufficient food by 30 percent. The fastest growing group of people who need some assistance with obtaining sufficient food to maintain a basic standard of living is the elderly. Hunger in America is estimated to cost the U.S. economy 167 billion dollars. Here, the long-term end goal for Republicans is revealed for what it is—a desire to make being a poor person into a crime.Comment: As DeVega explains, racism against brown-skinned people is a prime motivation behind the push to punish the poor. 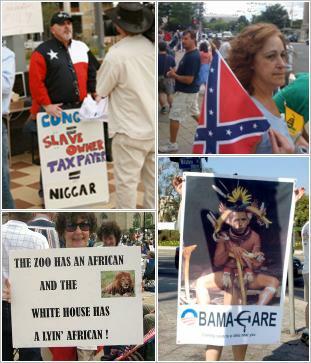 For more on conservative racism, see Anti-Government Extremism = White Supremacy and Conservatives Fear Minorities.